Of all the potential pitfalls and rewards that come with the choice of staging a site-specific play – and the one that fascinates me the most – is the X-factor. The uncontrollable element. The condition of staging a controlled work in an uncontrolled environment. You have to factor in available light, unpredictable weather, hungry bugs, volume issues and people who call the cops on you. That last one happened at the play I saw tonight, and it’s a first for me. 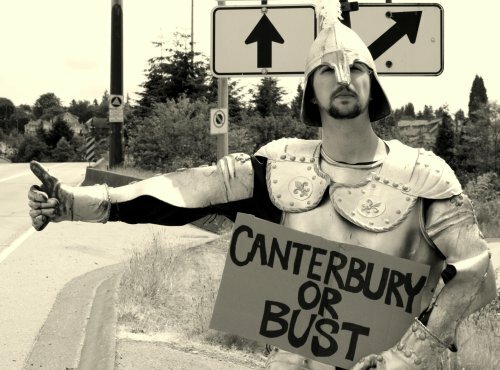 I caught the sold-out performance of The Road to Canterbury tonight up at Queen Elizabeth Park, it’s the latest tweaked-history laugh riot from the young crew at Itsazoo Productions. Basically a guided tour through comical contemporizations of Chaucer’s The Canterbury Tales, it’s a youthful and confident stroll through a pretty setting-turned-historical context. With tonight’s added bonus of being surrounded by an actual SWAT team and buzzed by a police helicopter. This is where the benefit of having a company equipped with cool heads comes in handy. One of the tour’s guides, you see, is a parody of an over-zealous American army vet now finding work and happiness in the arena of private security. His costume sets him as such, complete with Marine corps tattoo, obligatory army boots, headband and prop rifle. That last little item apparently raised a bit of a fluff with at least two separate members of the public with whom the production nightly shares the park , as the local authorities received a couple of alarmed calls from the cell phones of some very concerned citizenry. Huge praise and props to FoH Manager Devon Taylor for handling the whole situation with note-perfect grace, not one line or feather was ever out of place. The professionalism and confidence of the company was inspirational. They all just had that “well, that’s the theatre” attitude about the whole thing. It was a pleasure to be a part of. The capper to the whole evening, solidly in the vein of site-specific randomness, was the rather, ah, incontinent old hound dog that took centre stage during the show’s finale and decided to continue the scene’s cheeky scatalogically-influenced opening right in front of the grave of Geoffrey Chaucer himself. For, like, 5 minutes. It’s the kind of thing that’s only funny when you’re there, where the utter ridiculousness of it can be shared with a common group experiencing it together. And the poor dog owner who had to make a mortifying forced entrance stage right to deal with his poor old dog’s mess…it was heart-breaking and hilarious all at the same time. And again the cast just went with the flow, and somehow wrapped the whole thing up before the light finally gave out. Bravo to one and all. Tonight was truly one for the books. Theatre rules. When I was working on Tony ‘n’ Tina’s Wedding, when it was at Chardonnay’s on Howe St, we were regularly visited by the cops. See, there’s a scene where Tony and his gang beat up Tina’s ex-boyfriend just outside the restaurant. That’s the joy of theatre! I love it! Both of the those events certainly kept energy buzzing! Full props (pathetic pun intended) to the police for not halting the show–glad our police force had the calm and patience to first figure out what was going on, establish that there was no danger and deal with it behind the scenes. I was in the audience and hadn’t a clue any of this was happening! This was absolutely hilarious. Besides the mosquito bites, great night. Well done. Wish I could’ve been there! It really IS a zoo!